Hello, I'm new to the forum and no idea if I'm posting in the right place so if not, please be kind! I'm currently living in Bad Lippspringe and trying to find some info about the British army being here in the late 40s to early 50s. I have been told that there may have been a posting in Bad Lip itself, if anyone has any info or can point me in the right direction for further research, I'd be very grateful? To add, I also have some photos of the building Im told may have been used, if it's ok to post those and I can figure out how! I'm sure someone who has more info on military archives for the time and place you mention will come along. Ref posting a photo. You will need to join 'Photo Bucket' or 'Flickr' or another similar programme. You move your photos to the site. Then create a URL from each photo. Copy the URL and Paste it into your reply on this site. Remember to use the reply 'Preview' button to check that your photo appears before 'Sending' your photos and any text. My main interest is Schleswig Holstein (I was at school in Ploen in the mid 1950s) but I do have a few bits of information which might provide a framework for your research. As I expect you already know it was the American Army who were the first Allied Occupants of Bad Lippspringe following their breakout from the Ruhr pocket and push eastwards to the Elbe and possibly Berlin. In late May 1945 there was a series of movements involving all the Allied Armies which resulted the respective units being located in the correct longterm Occupation Zone. According to my information (G War Diaries for 3 (UK) Infantry Division) 7 Field Regiment Royal Artillery were the first British unit to be based in the town, arriving on the 25th May and departing for the United Kingdom that September. Not sure who their replacements were. Headquarters 147 Brigade of 49 (West Riding) Infantry Division were definitely based in Kaiser Karl's Bad building from April 1946 till October that year. I believe that a Brigade Headquarters was based in the town for the next decade. Certainly according to my information Headquarters 33 Armoured Brigade of 11 Armoured Division was based in the town from 1952 to 1957. Thankyou for that, very interesting. It might help if I explain briefly what has triggered my interest. There is a clinic in Bad Lippspringe that had been empty since 2014 and the medical history of it captured my imagination. In the process of chasing that history I discovered a gap in the clinic records from the late 1930s until the early 1950s. I have heard rumour that at some point in that time the British Army was in there. I've also heard that they and the Americans liberated a Russian POW camp nearby, but that's going off on a tangent (although I did find the cemetery in the local woods). Back to my original point, the clinic is scheduled for redevelopment now, possibly demolition, so if it has a connection with the British Forces, I'd love to know about it before it goes. Ditto for Bad Lip generally. Looking at John O'Meara's contribution it would appear that his father's unit was based in the area shown Klinik am Park off the Cecilien Allee on Google Earth. However another regular contributor to this site identified what is now known as the Cecilien Klinik on the corner of Lindenstrasse and Walstrasse as the location of 30 Field Ambulance. The two sites could be correct it was not unknown for a medical unit to be in split location, the medical facilities in a suitable civilian building, the administrative element including vehicles, bulk stores and some living accommodation elsewhere. What is the name and exact location of the particular building you are interested in? The team might be able to identify it from our communal working notes. Not so far "off at a tangent" the Russian PoW Camp at Eselsheide North of Hoevelhof was liberated about Easter 1945. The Allies (BR 21 Army Group - the Americans did not stay) evacuated a number of clinics in Bad Lippspringe to house and treat some of those prisonners. As my memory serves this included the August Viktoria Klinik. 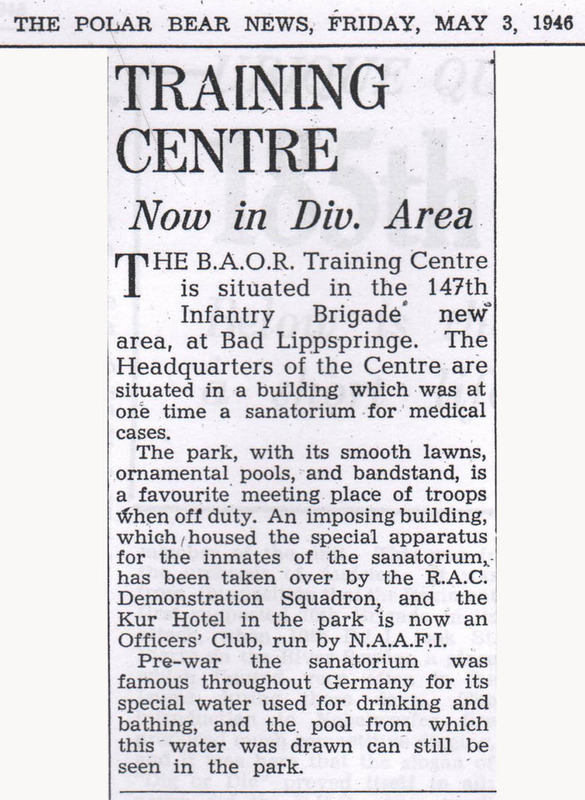 (If you have access to the 41 AEC Library in Normandy Barracks Sennelager there is a History of the Training Area (in German published 1992) that covers some of the occupation of Bad Lippspringe details! A quarantine hospital was also set up at Staumuehle camp for TB patients. The sanatorium with spa springs was/is the Kaiser Karls Bad. NAAFI also operated a Lemonade Factory in the town - into the 1950s. In the evenng following the capture of the town the manager of the local Lichtspiel Theater (Cinema) opened for business as usual despite a curfew - few patrons. Apologies for taking so long to get back on here and reply. Very rude of me. JPW, the building I was interested in is the Auguste Viktoria Klinik. It is closed now, but I have managed to get someone to let me in for a bit of a nose about and using some old plans and pics have figured out the bits that would have been in use at the time. There is a real gap in the buildings official history for the time the British Army would or might have been in there. It is not a very popular topic to raise with the locals either, the older people don't want to talk about it. The younger people don't have the knowledge or the interest. There is still a camp at Staumeuhle, it was recently used to house those who have arrived in the recent migrant crisis. I believe its empty again now following a fire up there. I did pop up for a look but didn't hang about. When I first started researching the building it was as part of a different project altogether but when I realised the British Army had been in Bad Lip in a capacity other than being housed here, it made me want to dig a little deeper. Especially with drawdown looming. Anyway, I am waffling on with little direction, I shall certainly post back if I find anything new or think of any other aspect I can pick your collective brains on! There are TWO camps at Staumuehle. The road from Sennelager to Staumuehle /Staumuehlestrase) is completely within the Training Area from Normandy Barracks all the way to the Staumuehle facilities. this road is an agreed route for emergency responders to reach the camps. On the western side of the road are brick buildings of a similar style to the former Alanbrooke Barracks in Paderborn - this is the front of the JVA (Yot Vow AAh) Jugendvollzugsanstalt the first closed youth prison modelled on the UK Borstal system (it also had a TB Wing) . At the end of the War this had been a Civilian Internment Centre (CIC Staumuehle) for former members of the NAZI Party, SS, Prison Guards, Card carrying Party members - where both men and women were incarcerated - around 8000 persons. During the War the premises had included an SS Hospital and Rehab Centre, and an SS Officers' Mess and reinforcement depot. The road from Bad Lippspringe (which is closed when the ranges are firing or dry training) to the junction East of the Bundeswehr Camp, is the Alte Bielefelder Poststrasse. I would like to make a contribution regarding Bad Lippspringe in the early fifties. My Dad ( Captain Charles Child) was the quartermaster at 30 Field Ambulance. We lived at 8 Mersmanstrasse and 210 Detmolder Strasse.. There was an AKC cinema that was near thue centre of town close to the YMCA. We were ther from 1950 to 1953 I myself had to go to PRS at Wilhelmshaven. I can remember a lot about my time and I have a feeling that I knewJohn O Mears. We used to cycle up onto the ranges when they were open and play on all the old tanks that were there and explore the empty villages used for target practice. Life was very good there much better than the austere times back homes I can help in any way with info I would be happy to tell what I remember.